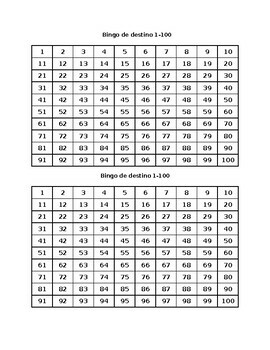 Bingo de Destino is an interactive, interpretive game to practice numbers 1-100. Students’ choose 10 numbers, one number in each row. Students call out the numbers themselves until one student has their 10 numbers called. Students need to follow along so they do not repeat a number that has been called already. I do not allow students to have their numbers in any type of line. The game usually lasts about 10-15 minutes and during the game almost all numbers are called before the game ends. As a preparation for Bingo de Destino, I often have my students play ‘Quien tiene?” with numbers 1-100, which is also available on TPT. I do both these activities after reviewing numbers 1-100 with a video by Señor Jordan.